She made him a hero ... According to her wildly popular dime novels he was a bounty hunter with integrity and the fastest draw this side of Wyoming, the standard against which all other men of the West should be held. But real cowboy Jake Cordell's just real tired of every two-bit gunslinger with something to prove coming after him. And now that he has finally put his father's killer behind bars, Jake's ready to reclaim his old ranching life. The only problem is, the old life hasn't waited for him to return. But he became her love ... Gutsy Kit Thornton didn't know how to get over her infatuation for Jake after he left town. 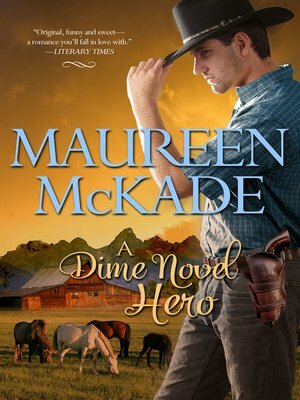 So she bought his ranch, adopted the son he never knew he had, and immortalized him as the fearless pursuer of justice in her fiction. Now Jake's back, and this dangerous, hardened man with the wild look in his eye is nothing like the tender boy Kit remembers idolizing. But with their lives so entwined around each other it doesn't take long for Kit's old feelings to flood back ... does this tougher Jake deserve to win her innocent heart again?